Zero Friction Golf Products, widely known for its colorful line of one-size compression fit gloves and Spectra distance golf balls, has once again been recognized by peers in the golf industry. Zero Friction won an ING Industry Honor award in the Product Ingenuity – Miscellaneous Products category for its growing line of Supertubes™. 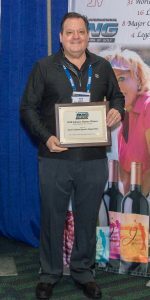 The ING Industry Honors program recognized outstanding achievement in the golf business on Thursday as part of the PGA Merchandise Show. The non-profit, media-based networking organization International Network of Golf conducts the awards program. This was the 25th Anniversary of the ING Industry Honors. Nominees in 12 categories are submitted throughout the year from anyone in the golf industry. Sub-committees that include people with expertise in specific categories then trim the entries to the top three in each category. ING members then vote electronically to determine the winners, who are announced and recognized at the Industry Honors Presentation Press Conference each January. tees. Supertubes are available in 6 cool neon colors (neon lime, neon red, neon orange, neon fuchsia, neon white and neon yellow) as well as licensed team emblems featuring NFL, MLB, NHL and the top 20 collegiate teams. 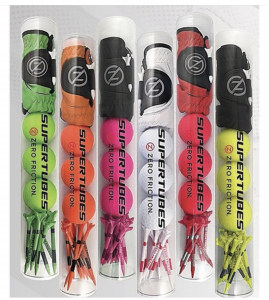 Last week, Zero Friction announced that the popular Supertube line had expanded to include the new Super Sleeve, which has 7 matte finished distance golf balls in one clear tube and can be custom logoed for tournaments and events. This is Zero Friction’s second ING Industry Honor award. The company received a 2016 Industry Honor Product Ingenuity award for the DistancePro GPS glove at the 2017 PGA Merchandise Show. For more information about the Supertube line, visit www.zerofriction.com, or call 630-317-7700.